Info "Bounce the spring to break the vase." Boing! is Wario's boss microgame for the WarioWatch mode in WarioWare: Twisted! 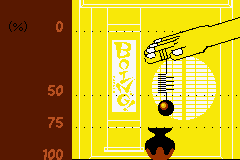 The game involves a spring attached to a person's hand, and the player must tilt the system repeatedly to make the ball go down and smash a vase. Unlike other boss levels, the player must clear it 10 times in the Spindex to get a gold crown. The player starts off the game with 10 seconds in the Spindex. 1st level difficulty: The vase is close by, so the player only has to shake the Game Boy Advance left and right. 2nd level difficulty: The vase is down lower. When smashed, a spider type creature appears sucking on the ball. 3rd level difficulty: The vase is so low that if the spring misses the vase, the spring immediately goes right back up to the hand. This page was last edited on September 19, 2018, at 22:25.